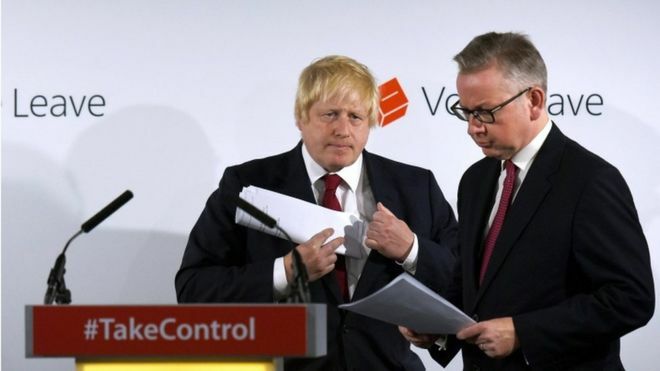 Michael Gove (right) had been expected to throw his weight behind Boris Johnson for Tory leader and PM. After he withdrew that support to fight for the leadership himself, Johnson threw in the towel. [Image: Reuters]. Oh good. Boris’s was the only Tory face the public even halfway liked. Whichever of the remaining grotesques wins the leadership, the Tories will be unelectable on their own. It looks like Messrs Murdoch and Dacre will have a big job on their hands – in many senses of the phrase – if a snap election is called, later in the year. Home Secretary Theresa May is among the candidates. Nominations shut at noon. Also in the running are Energy minister Andrea Leadsom and Defence Secretary Liam Fox – who campaigned to leave the EU – and Work and Pensions Secretary Stephen Crabb, who backed Remain. What a shower of utter cretins these people are. Johnson brings the economy to its knees, then came the realization that his sordid little selfish gamble with the people as pawns hadn’t gone his way, so he, like Cameron, takes the coward’s way out. I repeat, what a shower of inept and corrupt cretins they are. All tactics by the fat tub of lard, he doesn’t to be leader now because of all the EU fallout, one of the reasons why Camoron’s quitting, he’s going to play the waiting game and then make his move for leader! 2 he is thinking ahead so that when the other eager beavers desperately fail at getting the Tories re-elected he can cone to their rescue in his Winston Churchill disguise. He already hascthexright soetcof glasses perched on the end of his snout. So they have separated the wheat from the chaff and ended with the dross. Tories think from here the only way is up, but we all know there is no limit to their meteoric demise. Obama himself was slagging UK politicians on the BBC this morning, until he was rudely cut of mid flow, Obama censored by the Beeb, now that would upset him if he knew.